Bring your 2018 membership card for free early admission. From the Flemington Area: Take Route 202/31 south for approximately 6 miles to the exit for Route 179 south. Once on Route 179, the entrance is about 500 yards on the right beyond the overpass. From the Lambertville Area: Take Route 179 north toward Ringoes. After about 5 miles you will see the park entrance on the left. GLEANING INFORMATION FOHCL is pleased to welcome Nonprofit Organizations and Educators to attend Gleaning on Sunday afternoon, April 29, 2018, from 3:30-5:00pm. There is no charge to glean and the books your organization gleans are free! Just bring your own boxes/bags for packing. If you are interested or know a nonprofit organization or an educator who would be interested in gleaning, email fohclfriends@gmail.com to receive the registration guidelines and form in advance. Registration at the door may delay your entry to the sale floor. 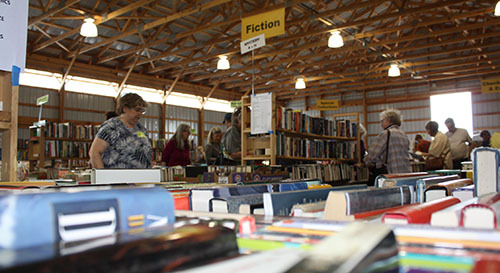 All book sale volunteers are also invited to glean on Sunday afternoon during gleaning hours. THANK YOU The money raised from the Annual Book Sale benefits your local library system and its patrons. Not only is the Book Sale our main fund raiser, it is a wonderful community event. Whether you make a donation, volunteer time, or just come and buy books, your support is appreciated!